In the fond memory of Saint Gellért of 11th century, the Gerard of Csanád Monument got built. You and your tour companions will definitely enjoy a good time visiting this popular tourist attraction. You will find the monument placed in a mountainous location that looks gorgeous being loaded with greenery. It is the same place where Saint Gellért breathed for the last time. You will find this 39 feet high Gerard of Csanád Monument click worthy. To reach this bronze statue, you need to cross a staircase industriously. Everything is beautiful from the height!! After reaching that height and experiencing the monument like this is really a good experience!! And the best part is, it doesn't cost! And from there you can experience the whole beauty of Budapest and the historical bridge. Overall, the whole experience was a package and beautiful!!! 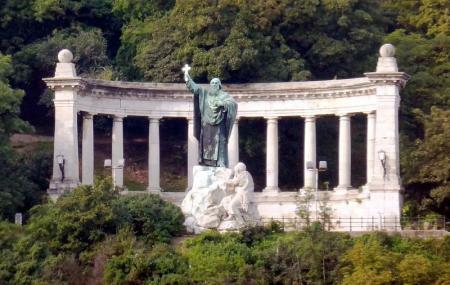 One of the most beautiful sites in all of Budapest, and there are MANY. After a hike up in the fresh air, its good to stop here and enjoy the view of the city and this fantastic monument. It is top of the hill about 300 steps .great view of the Danube river and the city . Great views of the Elisabeth Bridge,Buda Castle and Danube river!